By now we have all heard the sad news that the Georgia Theatre caught fire around 7 a.m. this morning. Wade Koch was walking home through downtown this morning when he noticed smoke pouring from the doors of the theatre and called 911. According to a press conference held by the Athens-Clarke County fire department today, it may be weeks before they can correctly identify what caused the fire. 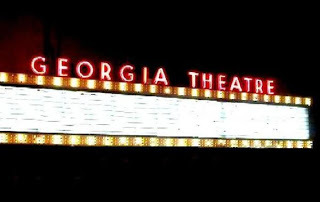 Georgia Theatre employees stated they left the air conditioner on all night due to the extreme summer heat. Most of the roof collapsed because of the fire, but the exterior walls are currently considered salvageable. The inside, however, is completely gutted. (see picture here). Georgia Theatre owner Wilmot Greene is committed to rebuilding the historic theatre. In the past, legenedary performers such as the B-52&apos;s, The Police, Widespread Panic, and B.B. King have taken the stage at the Georgia Theatre. Perpetual Groove, who was slated to perform Friday and Saturday at the Georgia Theatre, will now be performing at the Classic Center. Saturday&apos;s show will be a benefit concert, with all proceeds from ticket sales going to the Georgia Theatre restoration. Click here to buy tickets. All shows slated for the Georgia Theatre during AthFest will be moved to Morton Theatre. To join the facebook group in support of the Georgia Theatre restoration click here.